Maybe his name is unknown to you, but probably that “The Apache 2.1” will ring you a bell… The stylish freestyler of the 2008 Youtube Secret Talents, that’s him! He is one of those who advocate style for style's sake: visual harmony and feeling of freedom above all. Pierre is also a competitor, and there too he is managing quite well, reaching place #24 at the last WSSA World Ranking of December 2008. Freestyle slalom is my passion. For me it is the perfect way to get away from it all. While I am skating I feel free, relaxed and I can express myself. In my opinion freestyle slalom doesn’t mean to do one trick and then next. For me it is not important to master every kind of trick. I prefer the style, the elegance. My aim is to find the best combination of my moving body and my skates. It is a question of: How can I control my skates in a perfect move. Well, I’m not sure. I think in 2002 I started to do freestyle slalom with my first K2 skates. I met the first slalomskaters in the city of Cologne. 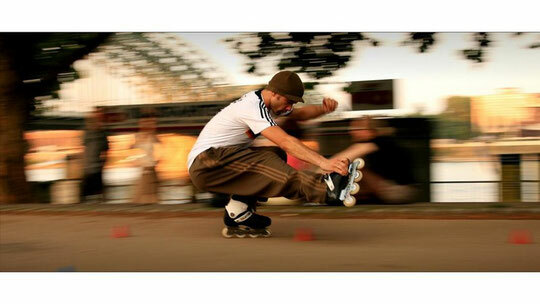 Since 1980 there have been freestyle slalom skaters at “Roncalliplatz” and “Domplatte”. 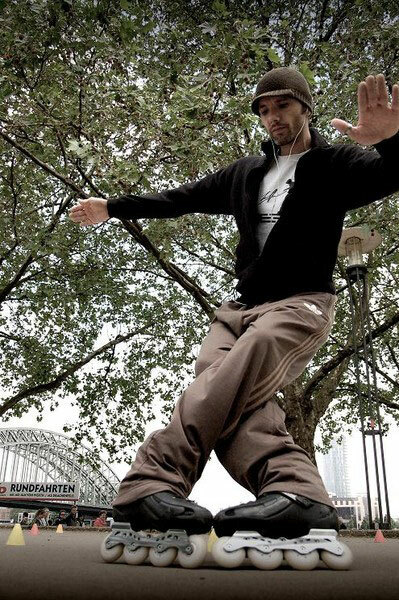 Cologne was the first city in Germany with quads and skates. I was totally fascinated by the skaters and especially the tricks they were doing. “Fish”, “backcross” and “one foot” … the guys were brilliant. skates. Over a period of one year I was skating alone. First I was learning the t-stop and afterwards the easier backward rolling. Oh my god – as I made it I was so proud! Later I wasn’t alone anymore. How were you introduced to freestyle? The other skaters helped me with my first steps in Slalom. At that time the guys did one trick on 20cones. According to that today I think this is the best way to learn perfectly slalom skating. I mean nowadays every rookie learns easily the trick called “crazy”, but s/he can’t do the trick “one foot” on 20 cones which denotes that the real slalom feeling with its flow and style is missing. But he gave me some website addresses about skating. When I got on the internet I was very surprised, because suddenly I became aware of the many other people who do the same crazy things on skates! Jumping, cruising, slalom, aggressive … and of course keep in mind - a lasting effect on me had the video from Fanny Violeau “Fannystyle”- I can say that was the beginning of real Freestyle Slalom for me. Later I found the German skating forum “skateclub”. There I acquired a lot of background knowledge and learned a lot of practical things, for example how to create your own custom Skate, how to make a banana setup, the advantages of a short frame (more flexibility) – and also important for me- I could watch other skating videos and meet other skaters in the chat. I am not sure but we had about 2.000 members. It was the biggest forum at that time and without those opportunities – maybe I would do table-tennis or something else today! Did you train on your own, with other people? First of all I have to say I hate to skate on my own! I prefer to have friends around me- for talking, laughing or to control the style, the tricks and the flow. I also need their feedback and they want me to help them. And of course I need music. Without music I can’t skate. Missy Elliot, RJD2, Moby is what I like to listen to while I am skating. I think the internet helps all skaters around the world to stay in contact and to organize skating events; especially the videos are quite helpful in order to develop new ideas of skating and to make our sport more popular. But I don’t like the copy of a copy. Everybody should have his/her own individual style. It is not too difficult to create your own individual tricks if you train regularly. A short chronology of the key-moments? In February 2006 I made my first short video “The Apache” which had a bad quality – but anyway, the people liked it and later even skaters in Paris knew the name “Apache”. For the first time I met some good skaters in Notre Dame. While JB Milleret and me were skating there– there was a crowd and people giving us money for our performance. (Thanx for these nice moments my friend) It was awesome! I also met Vince V.Khan - I really enjoyed it. At the PSWC I met Sebastien Laffargue and Igor for the first time. In December 2006 I had my first competition at the “Freestyle Slalom Festival” in Bremen. It was a great event – organized by a very good friend. I finished first in the style category. In 2007 I performed on some shows in Germany – in summer I participated in the PSWC the first time and I had some great moments there. (Today I don’t really like my style at that time.) I met Xuan Le for the first time- I had never seen such a good style before! In 2007 I also made the video “The Apache2” and later “2.1”. In December Sebastien asked me to become a member of the team SEBA – which means a lot to me! 2008 was the best year ever! In January I came off second best with my video ”The Apache2.1” at the Youtube Secret Talent Award. Together with the SEBA team I travelled all over the world, for example to Moscow. I reached the semi final and met KSJ. I had a great time with Naomi from London, Yury from Russia and of course Rudy from Germany. Another great experience in 2008 was my trip to USA- together with Xuan Le. First we travelled to NYC, later to Battle US in Seattle. For my first time I won a price and I was (I am) sooooo proud. We gave lessons in skating and met a lot of good friends. In December GOOGLE had a show in Israel and I performed on stage there. When, why, how did you do it? I think I’ve made our sport a little bit more popular in Germany and I am very proud of it. My videos are just “low budget” ones, but I think that people can feel the spirit of Freestyle Slalom in my videos. When I heard about a Talent Award from Youtube I was thinking: It is a good chance to make our sport more popular. I participated in the competition believing that I had a good chance for a nice place. Some weeks later Youtube let me know that I was under the top25 and they invited me to Berlin. I took Rudy with me for having 2 nice days in the capital. And in the end … I made the 2th place. To date over 250.000 people have been watching this video and I think: It was (!) a very good commercial for our sport. How did/do you cope with the success? Many people still write emails to me, a lot of questions – from all over the world. That’s why I decided to make a video about this special day and the moment of the award ceremony. This year I am once more invited by Youtube to come to Berlin to perform a Slalomshow on stage. I am very proud of representing one more time our sport and our team SEBA. You’re taking part quite essentially to battle competitions. Why? I love the spirit of a competition. It is not the “fight” between skaters, it is more the fun with friends and the possibility to spend some time together. In addition I think the battle modus is also more interesting for the audience. I like the different music by a DJ and also the pushing of a MC. Finally I like the Battle Modus – for me this is real freestyle. You have to check the runs of other skaters in your group and you can directly give answer in the way you skate. At that I have to say that I have respect for the judging in a battle. At the PSWC 2008 I was a judge member and I know now – it is not easy to judge a battle. Of course- there are many opportunities. Since December 2007 I’ve been travelling around the world and met a lot of international skaters in the last two years. Because of my travelling to foreign countries I asserted that our life in Germany is really good. Sometimes we forget these things. But all in all the best opportunity is the fact that I found a lot of very good friends all over the world and I will not miss these things. What about your slalom sessions now? At the moment I wish I had more time for training and for creating my own nice combos between tricks. But because of my own little company I can only skate at the weekends and even if the weather is dry. Unfortunately in Cologne we don’t have an indoor place to skate. So I can`t skate regularly in the winter. Sometimes I visit friends in Mönchengladbach or Wuppertal and skate a little bit – but I can’t say “that’s real, serious slalom training”. So much for that. What are your aims in your personal improvement for 2009? I hope in summer there will be enough time for training. My aims are to learn and develop new tricks. (I have a lot of ideas) At the upcoming events I hope I can show some wheeling tricks … I swear, I’ll train hard for these things. Yes, I also like snowboarding. We have an indoor place – here you can find snow 365days the year. I also like to take nice pictures with my cam. More to say ? special thanks… ? I have a dream: One day, WSSA and IFSA had a big Slalom event in Paris at the Trocadero with over 200 skaters from 20 countries. What a nice festival! The USA Skaters Jeremy, Megan, Doug and especially Nancy. Last but not least Sebastian for inviting me to the SEBA Team. It was a great pleasure for me!